Can’t have eggs or dairy? No problem! 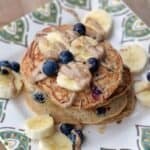 Make these amazing Super Simple Whole Wheat Vegan Yogurt Pancakes for breakfast. You’ll sub a flax egg for eggs, almond milk for cow’s milk, and soy yogurt for dairy yogurt. How is it already almost September?! We’ve already had a few cooler days in Minneapolis (upper 60’s) and I AM NOT READY for summer to end. I still get back to school anxiety every year around this time even though I haven’t been in school for 5+ years. What really gets my palms sweaty is when I walk into Target and see back to school signs everywhere. NOOOOOOOO. I think the only thing I miss about back to school is new pens. There’s nothing like a new pen. 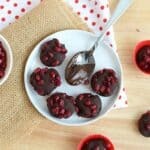 Today we’re partnering with Silk to bring you a back to school friendly recipe that will have the entire family obsessed. 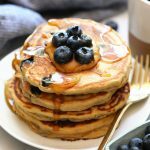 These whole grain pancakes are vegan, made sans dairy or eggs! They feature Silk’s yummy dairy-free yogurt alternative, which adds to the creaminess and flavor of the pancakes. They’ve got tons of flavors and for those that like to flavor their own yogurt, they have a plain variation. This product is an excellent replacement for those that can’t do dairy, but still want a protein-packed tangy supplement. There’s 6g of protein per serving and no high-fructose corn syrup included! Find more Silk yogurts year you and snag a coupon here! So like I said above, these pancakes are 100% vegan! We don’t have a ton of experience making pancakes without farm eggs, but let me tell you, the flax eggs made these pancakes extra moist. If you’ve never made a flax egg before, it’s super simple. All you do is mix together 1 tablespoon of flax seed meal and 3 tablespoons of water. Let it sit for about 15 minutes or until it becomes slimy/gummy. This will help bind everything together just like an egg. When I gave Mark a taste test of these pancakes he said, THESE PANCAKES HAVE THE BEST TEXTURE I’VE EVER TASTED. Winning. These pancakes are such a great base for endless add ins and toppings. We made half the batch with wild blueberries and topped them with almond butter, hemp seeds, more yogurt, and maple syrup! SO GOOD. Because I know this question will come up. YES. FREEZE THEM! Make sure you let them cool all the way before wrapping them in plastic wrap and then tin foil. They will stay good for up to 3 months. First, prepare your flax eggs by mixing together 2 tablespoons of ground flax seeds and 6 tablespoons of water. Let sit for 15 minutes. Next, mix together dry ingredients in a medium-size bowl and set aside. In a large bowl, mash banana until liquidy. Then, once your flax eggs are slimy/gummy, add those to the large bowl and mix. Add in the rest of the wet ingredients other than the coconut oil and mix well. Finally add in melted coconut oil and mix until smooth. As your batter sits it may thicken, so add extra almond milk as needed. Preheat a large frying pan to low/medium heat and spray with coconut oil cooking spray. Scoop a heaping 1/3 cup of the batter onto your pan and cook for 3-5 minutes on each side or until golden brown and fully cooked. *These pancakes cook the best on a lower heat. If your burner is set to medium/high, the middle may not cook all the way through. *As your batter sits it may thicken, so add extra almond milk as needed.